So I bought the digital version of Alien: Covenant yesterday — the DVD, Blu-Ray, and 4K UHD versions will drop in a couple of weeks — and there are a number of cut scenes and digital-only vignettes, including “Phobos” and “The Crossing.” But there’s one extra in particular that’s of considerable interest to fans curious about the future of the franchise. Entitled “Advent,” it appears to set up the next movie in the series, Awakening, which Scott plans to film sometime in the next year or so. SPOILER WARNING for those who haven’t seen Covenant or don’t want to have the contents of “Advent” spoiled. Set after the events of Covenant, the six-minute short is a transmission from David to Weyland-Yutani, drawn from his own recorded memories of working in his laboratory (most of it is in a first-person POV). He presents his message as “olive branch” in which he details his work on the Engineers’ planet and his attempts to uncover the secrets of the pathogen discovered by the Prometheus crew on LV-223. We learn that he killed the Engineers in the hopes of creating a “second Eden” with Dr. Elizabeth Shaw, but when she refused to go along, he killed her, though he later attempted to resurrect her as “something more than human.” When that failed, he salvaged her body parts as the basis for his earliest researches. 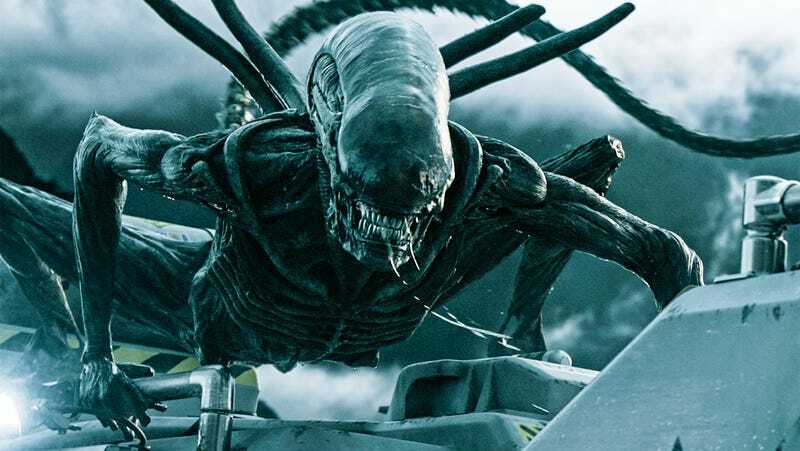 It also explains the existence of the crashed derelict on LV-426, which appears to have been hundreds or thousands of years old, and yet was full of xenomorph eggs. Presumably there were times when the Engineers created Aliens, but they might have used them as shock troops in wars with other species, or created them by accident. Maybe the Alien is easier to create with other genomes, and the Engineers had bred those qualities out of their own planet’s lifeforms as a precautionary measure, especially since, based on the available evidence, things start to get out of hand very quickly. This sets up a clear scenario for Awakening. Weyland-Yutani is aware of David’s experiments, and they know that he’s headed to the Origae system. In the time that it’ll take for another ship to arrive, he will have already established a colony and begun work on perfecting his creations. Presumably there will be some sort of expedition, possibly set up as a rescue mission, but with the intention of gathering intel and specimens, and presumably neutralizing the rogue android. Sort of a Heart of Darkness/Apocalypse Now scenario, in other words. Of course, this assumes that Awakening gets made at all, considering that Covenant only made around $230 million worldwide off a budget of almost $100 million, and that Sir Ridley is almost eighty years old. But then again, in an industry dominated by decades-old franchises and shared universes, it seems unlikely that Fox would shut down the series entirely. I just hope they keep the Predators out of the mix.